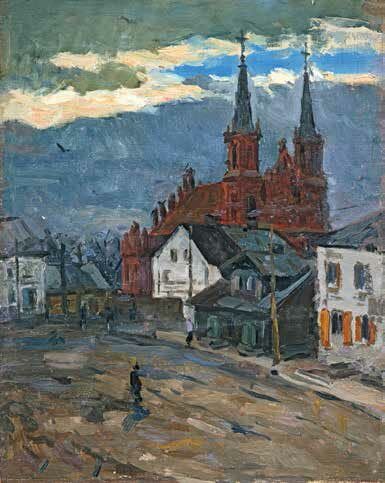 KONSTANTIN MOLCHANOV (1906-1980) WAS BORN IN MOSCOW AND GRADUATED FROM THE RENOWNED VKHUTEMAS-VKHUTEIN (RESPECTIVELY, THE HIGHER ART AND TECHNICAL STUDIOS, OR THE HIGHER ART AND TECHNICAL INSTITUTE, AS IT WAS KNOWN AFTER 1926). 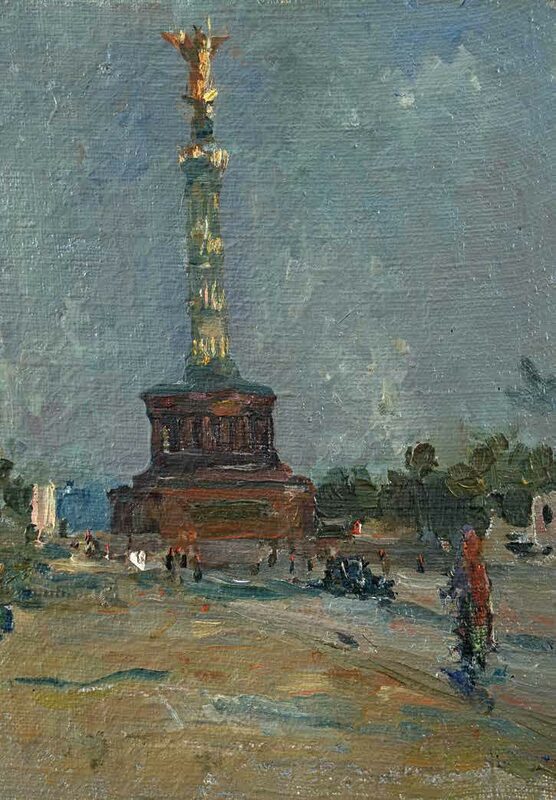 HE WAS ONE OF THE FIRST MEMBERS OF THE MOSCOW BRANCH OF THE UNION OF SOVIET ARTISTS, A DISTINGUISHED TEACHER AT THE MOSCOW SECONDARY ART SCHOOL; HIS MILITARY SERVICE BEGAN WHEN MOSCOW WAS THREATENED BY THE APPROACHING GERMAN ARMIES, AND ENDED IN BERLIN. THE ARTIST'S DAUGHTER SVETLANA AND GRANDSON VALERY MOLCHANOV TREASURE THE MEMORABILIA THAT TESTIFY TO HIS CONTRIBUTIONS TO THE WAR EFFORT: HIS MEDALS "FOR THE DEFENCE OF MOSCOW", "FOR THE DEFENCE OF STALINGRAD", "FOR THE LIBERATION OF WARSAW", "FOR THE CAPTURE OF BERLIN", "FOR VALIANT LABOUR IN THE GREAT PATRIOTIC WAR 1941-1945", "FOR VICTORY OVER GERMANY IN THE GREAT PATRIOTIC WAR 1941-1945", AS WELL AS THE ORDER OF THE PATRIOTIC WAR 2ND CLASS, A "DISTINGUISHED COMBAT ENGINEER (SAPPER)" BADGE AND MORE THAN 60 LETTERS OF COMMENDATION FROM HIS COMMANDING OFFICERS. Konstantin Molchanov was still very young when he first learnt about war and the human suffering that it brought. 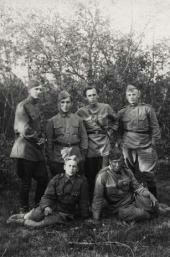 During the civil War, when Muscovites were dying of hunger and disease, Konstantin’s elder brother Mikhail, a company commander with the Red Army railway troops, took the 13-year-old boy under his wing. 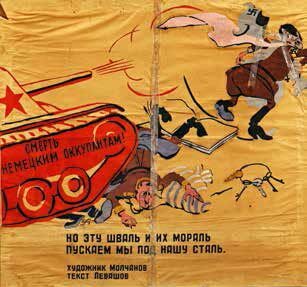 Using the sides of the armoured trains as canvases, the gifted teenage artist painted revolutionary slogans and savage, animal-like images of national and international enemies which peeked out at the viewer from behind the backs of the peasants, themselves victims of enemy propaganda. 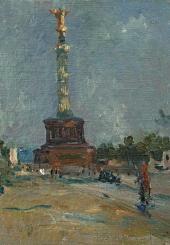 In the 1920s, Molchanov dedicated himself to his art studies at VKHUTEMAS; in the 1930s he began his career as a professional artist, travelling to major Soviet construction sites, taking part in numerous exhibitions, and teaching and working at the verkhnaya Maslovka Studio, the first building in Moscow constructed specifically for the needs of its artistic community. 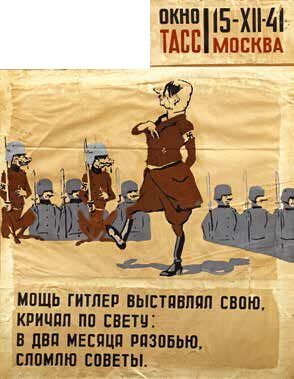 Molchanov began a new phase in his career in 1941, when he joined the legendary team at the famous military and defence caricature and poster studio “TASS Windows"; he worked there from October 1941 until the second military draft in July 1942. It was a pressured, round-the-clock job; most of the time, he worked to deadline creating posters in cooperation with poets and writers. 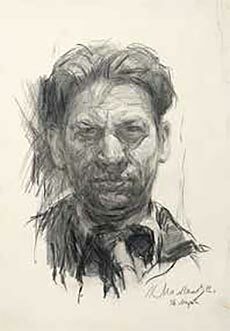 His studies and professional practice at VKHUTEMAS, from which he had graduated in 1929 as a technical artist and specialist for the publishing industry, and his later experience working as a draftsman and poster artist at the Visual Arts Publishing House, all helped him in his new role. Perfectly concise, imaginative and expressive, his sharply satirical images mocked the Nazis, and he vividly revealed the very essence of each unsavoury enemy "character". 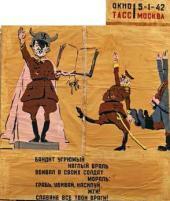 Some of Molchanov’s posters were shown at the 1942 Historical Museum exhibition "The Defeat of the Nazi German Troops at Moscow". A reviewer of that show pointed out in "Literatura i Iskusstvo" (Literature and Art) newspaper that along with the established artists "of 'TASS Windows', such as Radlov, Radakov, the Kukryniksy, Goryaev, Cheremnykh and Shuhmin, some new ones found their voice, including Molchanov and Deineka." In July 1942, under a special draft from the Moscow branch of the Union of Soviet Artists, Molchanov was sent to the Stalingrad front. For many long months he served as an enlisted soldier, a crew member for a 45-mm anti-tank gun. 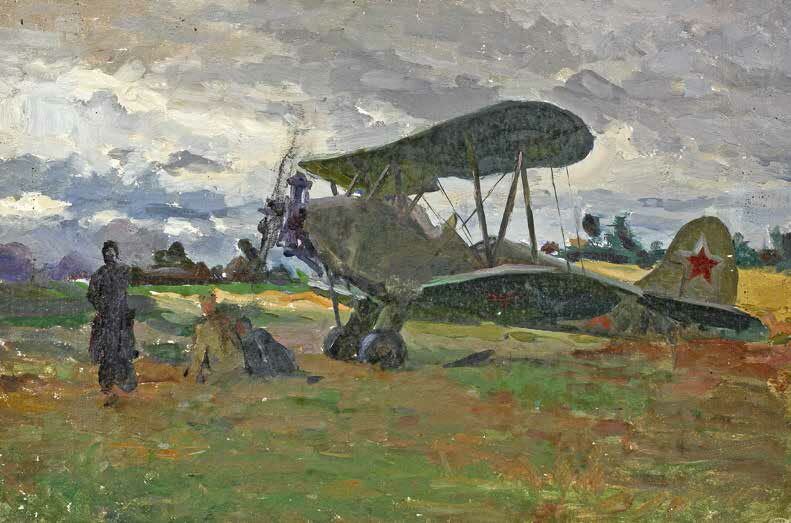 In combat, the crew was so exposed to enemy fire that each member might be wounded or killed at any time, so the shell-bearer Molchanov had to learn how to load and aim the gun: his sharp artist's eye and knowledge of perspective came in handy. Destroying a rapidly approaching enemy tank became possible from the distance of 200 meters - no wonder their soldiers nicknamed their gun "Farewell, My Homeland!" They dug their trenches with small "sapper's shovels", and often had to drag their guns into position. 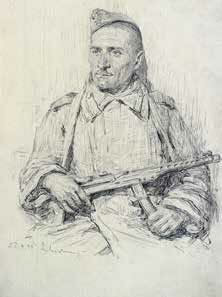 Two pencil drawings by Molchanov reflect such experiences, "The Last Man standing" and "Changing Firing Position". 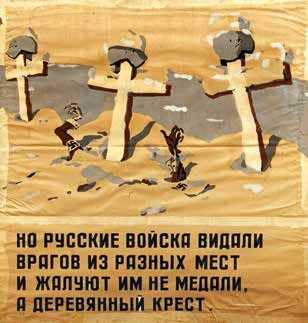 His letter to his wife, written on October 28 1942 from Stalingrad, survives: "My sweet darling Musya, what can I say about my life here? I am outside day and night; we sleep either in the field or in the woods. The sound of artillery, shelling, aeroplane raids and enemy fire is all almost constant, with short intervals. We are advancing successfully. 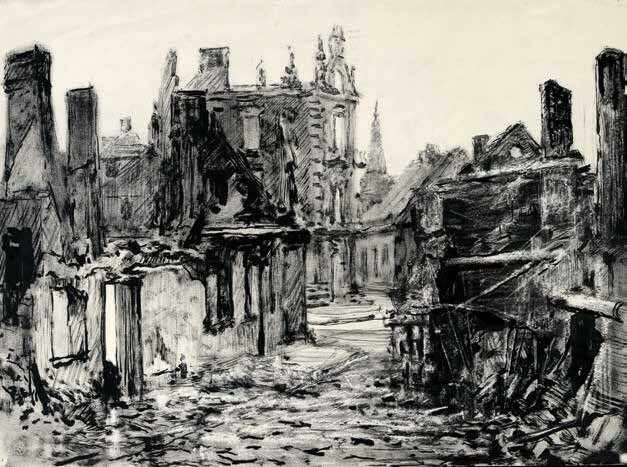 I wish I could work as an artist..."
Even under such conditions Molchanov used every opportunity to sketch on any piece of paper or cardboard he could find, trying to capture everything that he wanted to remember, most of all the people as they courageously endured the hardships and horrors of war. 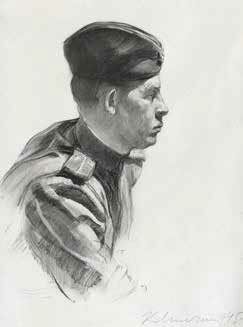 Masterful and insightful, Molchanov's pencil and charcoal portraits of soldiers and officers show us the inner lives of those men, young and old, tired, focused, sometimes even smiling happily as they sit for the artist, thinking of something that was dear to them. 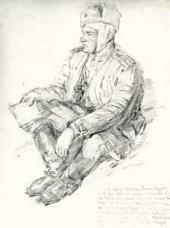 It is hard to avert your gaze from these drawings - every one of them tells a story of life at the front. In Belarus, Poland and Germany Molchanov painted a series of small-scale studies of the nearly-destroyed ancient towns of Europe, views of their deserted squares and alleyways. 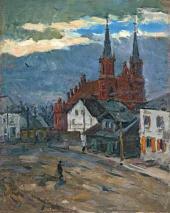 All his works that survived the war were first shown at two exhibitions in 1945. One of them, "Combat History of the 1st Belorussian Front", initiated by Marshal Georgy Zhukov and Military Council Member General Konstantin Telegin, was held in the ancient Polish town of Minsk Mazowiecki: artists, both soldiers and officers who had served in the Front's many units and formations, exhibited their works. 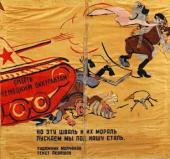 The second exhibition, "Combat History of the 16th Air Army. 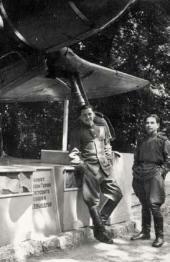 From the Volga to the Elbe", took place in Woltersdorf, close to Berlin, on the grounds of a former resort, and included, as well as the works of art, pieces of weaponry, both Soviet and German. 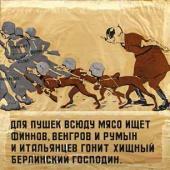 The Soviet Military Council directed the assembling and preparation of such materials, with Molchanov the driving force behind the visual arts section. A surviving photograph of the exhibition hall shows almost two dozen of his own painted studies hanging on the walls. The Molchanov family treasures everything to do with the artist's oeuvre, including each frayed piece of paper with his drawings or notes, and photographs and documents. Among them is a yellowing letter of July 25 1945 recommending that Konstantin Molchanov, "who fought in the Great Patriotic War starting from 1942 on the Don, Central and 1st Belorussian fronts", be awarded the Order of the Patriotic War 2nd Class. 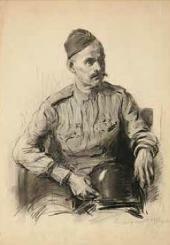 The accompanying short list of his personal combat feats of valour and achievements states that he "undertook significant efforts to create visual materials to record the army's history... generated dozens of posters, created numerous magazines, designed the interior of recreation centres and dining-rooms for pilots, complete with all the visual materials used for character development and for portrayal of their heroism in combat." 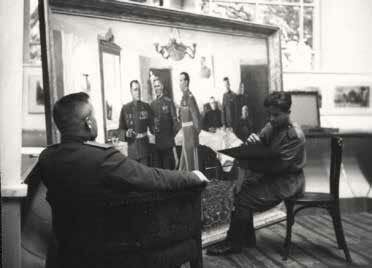 His paintings are also listed: the large-scale "Generals Planning the Berlin Operation", "Portrait of Twice-Hero of the Soviet Union, Major Kozhedub", "Greeting Pilots after Air Combat", and "End of a Day at the Front", as well as his "40 studies and sketches of army life and combat". The post-war years saw many exhibitions of Molchanov's works; held in his beloved native Moscow, they included solo shows as well as group exhibitions with his fellow "war artists". A true representative of the Russian intelligentsia, Molchanov treated people and the world around him with love and kindness: right up until the end of his life, he remained a tireless and dedicated artist who also taught hundreds of gifted children at the Moscow Secondary Art School. Now adults and accomplished artists in their own right, his former students always remembered his amazing kindness and humility: it was only when they attended Molchanov's exhibitions that many of them also learned that he had been one of those who, through his spiritual art and hard efforts as a soldier, had fought selflessly for our Great Victory. TASS Window No. 295. 15.12.1941.